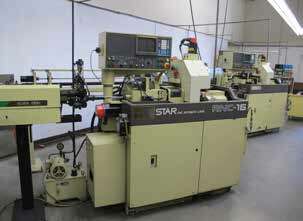 AUCTION DATE: TUESDAY, AUGUST 27, 2013 – STARTING @ 11:00 A.M.
A PLUS PRECISION MACHINING, INC.
BADGER 14 X 40 GAP ENGINE LATHE. HARDINGE HS HIGH SPEED LATHE. BRIDGEPORT VERTICAL MILL WITH P.F., VAR SPEED, 1.5 HP, 9 X 42 TABLE. HARDINGE DSM-59 2ND REID 2-B, 6 X 18 SURFACE GRINDER. BALDOR GRINDERS, SANDERS, DRILL PRESSES, ARBOR PRESSES, TUMBLERS. INSPECTION TOOLS, GAGES, DELTRONICS, MICS, CALIPERS, HEIGHT GAGES, GRANITE PLATES. THREAD GAGES, BLADE MICS, AND ETC. DELTRONICS 14’’ COMPARATOR WITH MPC-200 CONTROL. CLARK 2500 LB STAND UP ELECTRIC LIFT WITH REACH AND CHARGER. CAPACITY, 3 POSITION END WORKING, WITH IKURA SEIKI BAR FEEDS, S/N 140193, 880453, 880581. LIVE TOOL, B SPINDLE, END WORKING, S/N 030505, WIT LNS HYDRO BAR MINI SPRINT BAR FEED. 8 POSITION TURRET, S/N 1323. 2) MORI SEIKI SL-1A CNC LATHES WITH 6’’ CHUCK, 12 POSITION TURRET, YASNAC LX-1 CONTORL, S/N 371. MORI SEIKI SL-1 CNC LAHE WITH 6’’ CHUCK, 8 POSITION TURRET, YASNAC 2000 G CONTROL, 5C COLLET NOSE, S/N 955. 2) HARDINGE CNC LATHES WITH OMNITURN OT CONTROLS. 1991 FADAL VMC-40 CNC VMC, CT-40, 10,000 RPM, 20 ATC, S/N 9104181. 1991 FADAL VMC-4020HT CNC, CT-40, 10,000 RPM, 20 ATC, S/N 9104182. 1994 FADAL VMC-4020HT CNC, CT-40, 10,000 PRM, 20 ATC, S/N 9406461. 3) HAAS 5C INDEX WITH SERVO CONTROLS.